LAJ: I guess what I'm most interested in is, simply, what it's like for you to live as an artist, at this moment in time, on a day-to-day basis. CE: It's hard because I have a job as well and take it seriously because it pays my rent. So I have two very strenuous occupations. I have an apartment and a studio. Two of everything: two jobs, two rents, two telephone lines, two bank accounts, even things like two hammers (need one at home, one at studio), etc. LAJ: Last week I read an article in the paper about how artists have been squeezed out of San Francisco and how the city may take steps to subsidize loft space, just to keep a few artists around town. The painter they interviewed complained that he is the only artist left in the loft complex where he lives and works; all the other artists have been replaced by "yuppies with computers". What do you think? Are we moving toward a day when only people with trust funds can afford to become fine artists? Or is this a time when, more than ever before, anyone who wants to become an artist can, with enough talent and drive? CE: People with their own money really can subsidize their art careers very nicely. But all kinds of people become artists against all odds. The first big painting I painted in San Francisco was done in my small bedroom of a shared apartment. There wasn't space to stand back and look at it or anything. What's really scary is that now I have a studio and lots of space but it's too expensive. So the tensions keep building the longer you keep it up, it seems. There isn't that much art being sold these days. Dealers are freaking out too. Still, does it stop any of us? Well it could, I guess. I'm always thinking of quitting--my life is pretty scary financially. I get too in debt trying to keep going--one always thinks things will get better. I was at the SF Art Institute MFA show tonight and thought about all these new artists and what their lives will be like, especially the ones that have chosen to do these huge sculputures--now there's a challenge. But hey, maybe they have trust funds to buy warehouses to keep this stuff in. But then again, maybe not. The art in the show seemed strangely forlorn, most of it. Obscure bits and pieces of things often scattered in loose arrangements on the floors and walls. Maybe those were the ones I noticed the most. LAJ: When I think about what it costs just to buy acrylic paint--much less oil, must less professional framing...it's hard enough to make anything worthwhile without having to worry about materials. I loved that scene in Camille Claudel--did you see the movie?--when Camille sneaks out in the middle of the night to steal clay from an open ditch in the middle of Paris. CE: I know I create way too much art for how much I am able to sell. I often wonder what this is all about. It just keeps pouring out. And you're right, the cost of the materials is astronomic! LAJ: What else...I also wanted to ask you a bit about technology and art. I see that you have images of your work on your website and I wonder what, if anything, you think will becomee of our more traditional art forms as we enter the 21st century with this tech-inspired millennial fever. CE: I'm quite a technology fan myself! I have especially fallen for the "wired world" developments. I was an eager participant in the cyberspace boom, coming online early...at the time of Mosaic, when The Well was still using UNIX commands. I love cell phones, pagers, the whole thing. Of course it all influences art, but it seems like it just adds to what's already there. I don't think painting will go away. I was always struck by Peter Halley's images (paintings) because they seemed to be perfect icons for what's happening, technology-wise. Also the fact that they were done first in fluorescent paint was a great statement about the techo-wired jazzed-up state of our increasing ability to communciate and operate from some isolated cell, but be connected to everyone else. How fast and inexpensive now to talk by e-mail to someone who lives in France--to really pick her brain (we both speak English). I think many of us are exploring that new reality. What does it mean to sit in your room and be able to roam the Internet, to do that CUSeeMe stuff? What does it mean to sit in your car and go from place to place on the freeways? Or fly to Europe frequently? As long as we have fuel, electricity, batteries even, we can interact in this incredible new world. Of course we may have to find new ways to power our explorations as supplies of traditional fuels are limited. I'm working to bring computers and computer training to people who don't always have access to them (at low-income housing properties--this is through my job). It's a new world, and an exciting one. And all of it will influence our art in various ways. 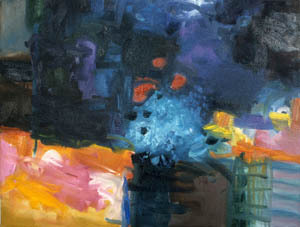 But the gesture, painting, the line--those are fairly durable manifestations of the inner self and will probably continue to excite those who look at paintings--they give the art viewer an intimate look at the inner life of the artist and communcate the intelligence, emotion, passion and stregth of that artist. Speaking of which, I'm currently reading Jackson Pollock, by Steven Naifeh and Gregory White Smith. What a good book! And as far as Pollock's paintings go, his line was so powerful, breaking the barriers in art that had never been broken before. Freedom, power, strength, excitement--freedom freedom freedom. There are a couple of Pollock quotes I really love. He said to Hans Hoffman, "I'm not interested in your theories, let's see your paintings." 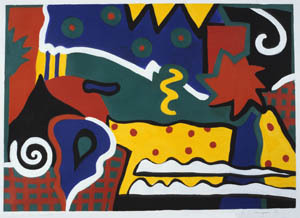 And when Hoffman chastised Pollock for not painting from nature, Pollock said "I am nature". LAJ: You said before that you're "always thinking of quitting". Have you ever quit for any length of time, and if so, what made you get back in? CE: Yes, I had a big interruption in my life in 1977 and stopped doing my art work then. Some background: I have a public health degree (MPH) because at one point I thought I wanted to change the mental health system. My (two) Masters theses were on "The Need for New Initiatives in the Mental Health System" and "Concepts of Madness and Social Response to Mad Behavior in Ancient Greece". 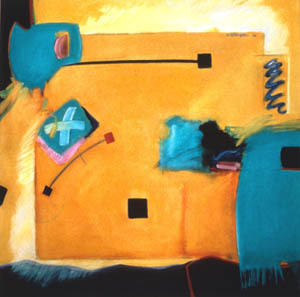 During my married life, '57-'77, I had problems which now seem to me to have been related to being married in the suburbs in the '50s through the '70s, having an artistic temperament (my father was a commercial artist, but throughout their lives both he and my mother painted beautiful oil paintings, primarily of the Southwest, as they have resided in Phoenix for many years now) and not being able to actualize my own talents, and it was making me really crazy. It also had everything to do with needing my sexual freedom which is quite different from being married--I have not remarried! I was put in the psych ward against my will three times, given shock treatments, the whole thing. In 1977 when this happened, I got a lawyer, got myself released from the psych ward (this was during the third time in), got a divorce and went to live with a friend (who basically saved my life by taking me into her family) and then fairly quickly got out on my own and finished my university education. Well, then nothing like those episodes ever happened again. But during that episode I threw away all my art work. It was a suicidal gesture in some respects. My first interest in California was when I became involved with some people in the Network Against Psychiatric Assault. I also met John Perry, a Jungian analyst out here who had a little program called Diabasis, where the whole attitude toward this kind of event--I would call it a breakthrough or a break-up rather than a breakdown!--seemed a whole lot more enlightened than what was going on with the people who were trying to figure out what to do with me and practically killing me in the process. The third round of psychiatric intervention resulted in me having a real heart attack--I nearly did die, and spent my 40th birthday back in the hospital so soon after the lawyer got me out! I thought I might try to start a program like Diabasis out here. However, changing the mental health system was like trying to change South Africa. And the people in the Network Against Psychiatric Assault quickly failed to hold my interest. None of them seemed to move beyond their stuck-ness in their situations--they didn't seem to get jobs--just to live on SSI or something. Well I guess by now some of them have done lots of different things. But I got sick of it fast. I had kept amazing journals of my experiences during my "altered states", but I burned them all and got rid of all my books on psychiatric reform stuff. I just wanted to move on. John Perry and even R.D. Laing, when I met them, seemed disappointing to me. The whole thing was a bit like art dealers living off artists--the psychiatric professionals and radicals alike seemed to live off (or get off on) the people who they claimed to help, and there was something unhealthy about it all. Also I couldn't really get the type of work I would have wanted once I came to San Francisco and it was much harder financially to be on my own than I had expected. I started out working in The Department of Public Health as a secretary in Emergency Services at General Hospital, hoping to get something in the mental health field there, but really needd to know another language besides English to get anywhere with their mental health system, not to mention that it was not easy with my radical and "reform" ideas to get anyone interested in hiring me. Now I feel kind of lucky to have put all that behind me and made a commitment to my art. I think working in mental health in San Francisco would have some really exhausting and frustrating aspects to it! I don't think I stuck to that question very well, so let me try to answer it once more. Yes, I'm always thinking of quitting. The stress of working a fairly demanding four-day job and doing enough art work to make me (and others) take myself seriously gets to me plenty of times. Money's always a problem, since more goes into the art than comes back and also because working so much leaves little time for marketing. Also working all the time cuts out a lot of social life. But I haven't quit producing art for any length of time since I started in earnest to take my art seriously and do my taxes as an artist--and that was in '85 or something. However, it could happen at any time. Also when things get hard in my personal life, it's a lot harder to do the art. And that has happened a number of times this past year or so. So, yes, I did quit when I was at the point where divorce was imminent. I started again here in San Francisco when I quit trying to get work in the public health system. That's when I got really serious about my art. LAJ: Do you see yourself as somehow different from people with other professions in your community, or essentially the same? CE: Yes, I do feel different than someone with a regular profession or career in the sense that I am committed to something that doesn't really make money--it brings in money, but not enough to be profitable, really. However, just paying for itself is a pretty major accomplishment. The expense of the studio, all the maerials, many of the things one almost must do, such as photograph work, maintain a huge mailing list, etc.--this all costs tons of money. And also there is the split between the "job" mentality I must assume during job time and the "art" mentaility I must maintain almost all the rest of the time. LAJ: If you weren't doing fine art, what else can you imagine yourself doing? CE: I would get some "rest"! Artists have to work so hard--essentially holding two jobs--the one that makes the money and the one that keeps the art career going. But of course I haven't taken the question seriously. That's because I can't imagine what my life would be like without doing the art. But as I say, that could be a reality at any time. When my personal life gets really rough, it's hard to keep going with the art--there just isn't that much of a safety net money-wise to let up on it, and there also is a huge output of psychic energy to keep the art thing going, so if my personal life drains that energy because things are really hard, such as in disappointments in love, family problems and that sort of thing, well, then it's a lot harder to direct enough psychic energy toward the art to keep it viable. LAJ: What kind of training, good or bad, did you have? 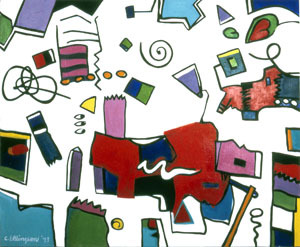 CE: I went to art school at the University of Minnesota in the '70s, but I was doing other kinds of things there as well--I was combining art with human services, and I was working in a very interesting program for troubled (and fearfully troublesome!) teenagers on campus--it was a kind of a lab for what I thought I wanted to do at that time. Under the guidance of some very bright people, I designed an art program based on behavioral objectives and a point system that paid off in cash, which was enormously successful with this population. My art classes were excellent there. It was just when abstract expressionism was fading in popularity, and I got in on what seemed to be the tail end of it, though I didn't realize it then. I was not taught technique; I was taught to do art, figure out (through feedback or my own growing ability) whether it was good or not, and keep working in the direction of what was good. Students who were interested in technique were generally "referred" to commercial art schools (ha ha). This kind of thing drove a lot of people nuts. But I think it is absolutely the best way to teach art. The artist doesn't end up doing commercial illustrative work. But I think it was a very solid art education, though I never took all the classes offered because I was working in another field as well. I think the San Francisco Art Institute, from what I can tell, has a similar strategy. Let the students have this contact with real artists--good artists--and from working with them they learn how to be an artist. To be an artist you start doing art. And you keep doing art, looking at art, learning about art, tuning into the art scene, thinking about art, doing a lot more art and some it starts to be good eventually and you keep going from there. LAJ: Who influenced or inspired you when you were just getting started, and have your feelings abou them changed at all? I think artists are very much influenced by other artists. As for my present contemporary art heroes (who make me wish I could do anything as good as they do), I love the images of Cy Twombly, Julian Schnabel, Barnett Newman, Robert Ryman, to name some of the great ones. The Cy Twombly show in Los Angeles a couple year ago was the most wonderful thing I ever saw. I have also been excited (at various stages of the game) about Peter Halley's work, Jeff Koons--he was outrageous fun (though he seems to have dropped out of sight), Rita Ackerman, and Andres Serrano, who did those huge morgue shots and those abstract photos Blood and Earth and Blood and Milk that I saw on cards in the museum shops in Los Angeles and thought, why oh why can't I ever find things like that in San Francisco!? And the whole young New York scene, though many of them are no longer all that young I suppose. Robert Hughes, the critic who did that American Visions book, would gag at that list! But if I could fulfill a dream, it would be to live in Manhattan for two years and just soak up the new stuff done by younger artists there for awhile. Here in San Francisco we rarely get a chance to see the sort of work that I think is so exciting and energizing. Then, going back, I always loved DeKooning before the late paintings. And Pollock and Motherwell. And going further back would bring up Matisse, Picasso, Nolde, Schiele. I guess that's enough. LAJ: I wonder to what degree you believe that "everyone is an artist". Let's say you had a friend who wasn't particularly talented and didn't have a lot of money to spend, but still wanted to try to express herself "artistically". What would you recommend? For whom do you have more sympathy: the person who covers her walls with bad art she's collected, or the person who's covered her wall with bad art she's done in her spare time? CE: Yes, I do believe everyone can do good art. 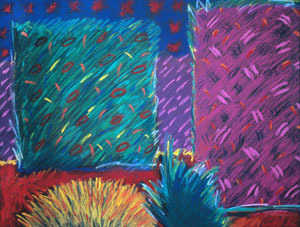 Not everyone is motivated to do so, and some have been ruined by art classes where art has been confused with drafting! Also I have to admit it helped me to see my parents doing art. I learned that it is something one can do. But you can see this in other places as well, such as in a good art class. To someone starting out, I'd say: Just start doing your art, looking at lot of art. Pick up the brush, the chalk, the clay and just start doing it. See what happens. Do a lot of work and some will be better than the rest. Work from that. Keep doing more art. Look at more art, and persist at your vision. Invest money in your art. Arrange your job life to accommodate your art. And unforunately most artists have to pay at least some attention to the business end of art. Learn about dealers, galleries, promotion, taxes. I must say I haven't done that much gallery-seeking--there seems to be little time left after doing the work. And also I've had some experiences with art dealers that have left a bad taste in my mouth. In fact, I'm just now at a point where I'm thinking about representing myself and just selling through my open studios twice a year and to people who arrange to come to see my work in my studio at other times. I do a lot of mailing, though! And I pay very close attention to making sure anyone who buys my art is satisfied with his/her purchase. But what makes you an atist is the work, the working, the persistence. Not everyone is motivated enough to do art on any kind of long-term basis. One might be easily seduced by the idea of being an artist--it's a tremendously glamourous identity--but you know what the word glamour means? "A delusion wrought by magic spells; charm; enchantment. Any artificial interest or association by which an object is made to appear delusively magnified or glorified; illusion, fascination, witchery" etc.! Being an artist is very hard work. Most artists don't make much money. And most artists I know work very hard (unless they have their own money to finance their art careers, and many of those artists work very, very hard) so it's not really glamourous after all. But I think few of us would want to give up the hard-won identity of "artist". And yet it seems like a certain level of activity is required to be taken seriously as an artist by the art community (which is what matters I think). Duchamp may have appeared to be a slacker, but he did plenty of work behind the scenes of this image he presented of himself as being a "breather". Of course much of the satisfaction of being an artist is the high one gets when the work turns out well, when it "works". And the pleasure in the process itself, the handling of materials, for me the thrill of seeing the colors, the composition that's really "socko"--the general thrill of doing the art.